Who else loves a good jean jacket? I've been practically living in this one! I love a good bargain! My favorite pieces from this outfit can be found at Nordstrom Rack for a steal! My denim jacket cost under 50$ and the tee was under 20$! I love picking up staple items from Nordstrom Rack, they are always reasonably priced and high quality. This denim jacket has been my go-to item on chillier mornings and evenings. In these pictures it is hard to tell, but underneath I layered this tee with my favorite bralette from Free People that comes in a wide variety of colors. I own this bralette in white and in mauve, although I do wish I had every color! I wear it quite often under loose tanks and tees for an instantly effortless but trendy look. I talked about the Sugarfix by Baublebar line at Target in yesterdays blog post but I wanted to mention it again. These earrings are also from their line and so cute! These come in a variety of colors to suit anyone's personality! (I also have the pink pair of these). I definitely recommend checking them out at Target if you're in the market for some summer earrings! 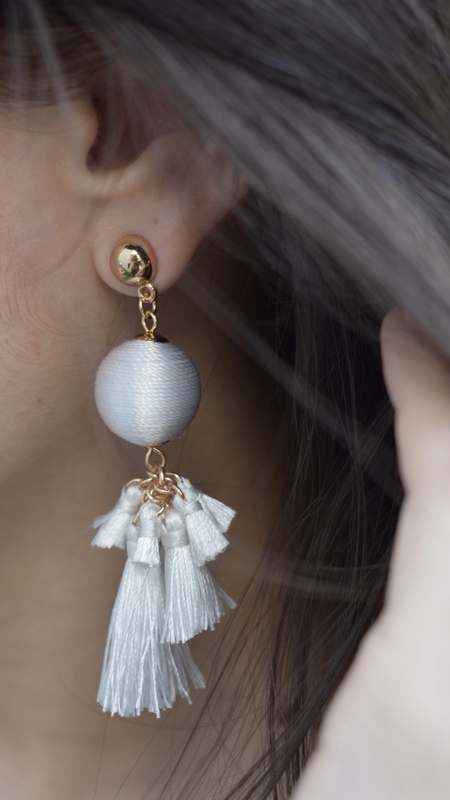 They are a great way to add a little flair to an outfit. What's your favorite Spring piece right now? Share it below!